Your best horsepower-per-dollar SUV deal has just arrived. Fiat Chrysler seems to have a recent obsession with putting lots of horsepower into as many garages as possible. If the muscle car is proof of anything, it’s that drivers from all sorts of economic backgrounds have an affinity for horsepower and cars like the Charger Hellcat and Challenger Demon are Dodge’s way of saying it understands that need clearly. But what about the rest of the FCA lineup? Maserati isn’t for those devoid of cash and no matter what we pray, the Alfa Romeo Giulia Quadrifoglio isn't likely to drop low enough to undercut the BMW M3 by a substantial margin anytime soon. 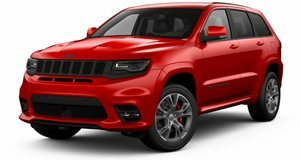 Thankfully, FCA has an answer for those wanting to buy into the high-horsepower SUV craze but can’t sign a check for a Mercedes-AMG GLE63 S. After loaning it out to a rogue YouTuber, Jeep just got around to announcing pricing on the Grand Cherokee Trackhawk, what it dubs as the most powerful and quickest SUV ever. For the starting price of $85,900 plus $1,095 in destination and handling, you can get behind the wheel of one of the highly limited number of muscle SUVs that are offered by American carmakers only once in a blue moon. Equipped with the same 6.2-liter supercharged V8 engine from the Dodge Hellcat brothers, this SUV gets up to speed pretty quickly. Though its 707 horsepower and 645 lb-ft of torque output must first overcome the inertia supplied by the Grand Cherokee’s porky frame before it can grab at the tarmac, it has a four-wheel drive system to help it get up and running, a feature the Hellcat doesn’t boast. The result is a 0-60 mph time of 3.5 seconds with the quarter mile passing by in 11.6 seconds at 116 mph. With any luck and a bit of coaxing, the Trackhawk may be able to be set up to run the quarter mile as quickly as some custom Hellcat-powered Grand Cherokees have managed. Keep the throttle against the firewall and it’ll only stop accelerating once it hits 180 mph. No mention as to what it can do in the corners, but a rear limited-slip differential, sticky tires, and a Track mode should help it defy belief. With a keen eye on balancing road and track performance with SUV utility, Jeep has done everything from lowering the ride height and installing beefy brakes to giving the Trackhawk towing capabilities. Look for these on dealership lots in the last three months of 2017.